Behind the French Menu: Sausages in France. A Short Introduction to France’s World of Sausages. The Sausages of France III. An important part of French cuisine. Sausages on sale in a charcuterie. The French sausage and the English kitchen. When William the Conqueror invaded England in 1066, he and his Norman-French Barons brought their cooks with them. This French connection brought French recipes and words with that changed the language and the cooking techniques in the English kitchen. Among the many words, they imported was the French word saucisse; saucisse would become sausage in English and part of the traditional Irish and English Breakfast. 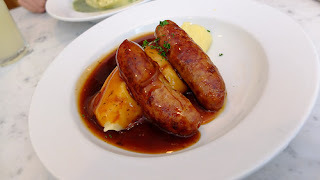 French sausages on restaurant menus, or in a butcher’s shop, often do not indicate with which meat it is made, and in that case, it is practically always pork. When a sausage is a beef or veal sausage, the meat will be explicitly named. For those with other tastes, sausages are not limited to meat. 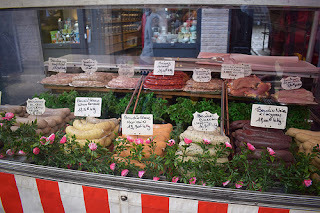 The menus of an upscale charcuterie-traiteur, a French delicatessen, may offer saucisses végétarienne, vegetarian sausages, and or saucisses de poisson, fish sausages, among their other options. 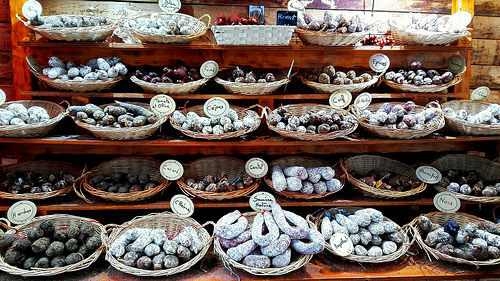 Many guidebooks and travel dictionaries translate saucisse as a small sausage that will require cooking, and a saucisson as a larger cured, smoked or dried salami type sausage. Unfortunately, French sausages do not read travel dictionaries, and today many sausages do not keep to the traditional rules. Historically all saucisses did require cooking before serving; however, that is no longer always the case. A menu listing today may note the serving of a saucisse sèche, which will be a small salami type sausage or as part of a cooked dish; while another menu listing may offer a saucisse sèche as part of a plate of cold cuts. Today, saucisse mostly relates to size rather than how the sausage is made and sold, and most French restaurants seem to expect their diners to know by name the type and taste of the sausages on their menus. You, as the visitor, should ask for more information and then you may enjoy your light-lunch even more. 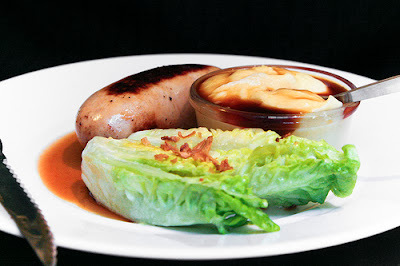 Aligot d'Auvergne Saucisse et Salade de Printemps – The Auvergne aligot mashed potato and cheese dish served with an Auvergne sausage and a fresh spring salad. The traditional Auvergne sausage is a small salami type sausage, weighing about 100 grams (3.5 ounces) each and made with pork, pork fat, and beef. When this sausage is served with aligot it is usually grilled; otherwise, it may be eaten uncooked like any salami type sausage. Saucisse Chorizo – Sold fresh, cured or smoked these are spicy pork sausages flavored with paprika and garlic. 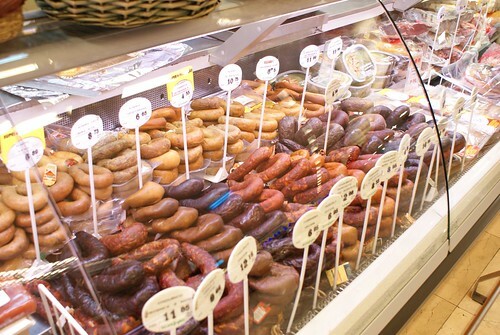 There are tens of different types of chorizos and the originals reached France from Spain. Saucisse de Foie – A liver sausage; in the USA that’s liverwurst, and it is mostly pork liver. Liver sausages, whatever the type of meat used cannot be 100% liver, for that you do not need a sausage, most are less than 50%, the rest will be meat and or vegetables, eggs, and herbs, etc. Slices of a saucisse de foie may be part of a plate of cold cuts. Saucisse de Francfort – The French Frankfurter; now the venerable hot dog. The Frankfurter, a traditional German sausage was brought to the USA by German immigrants. The Frankfurter n its new home became the best selling sausage in the world as the hot dog. In Germany and in France most frankfurters are still the original pork sausages though 100% beef and veal frankfurters are also available. Saucisse de Francfort avec Pommes Frites. – A Frankfurter served with French Fries, chips. Saucisse aux Choux - A pork and cabbage sausage. Different recipes for these traditional sausages are made in various parts of France and will be on sale and on menus nearly everywhere. A pork and cabbage sausage. Morteau and the Saucisse de Morteau IGP - The sausage, the town, and its clocks. 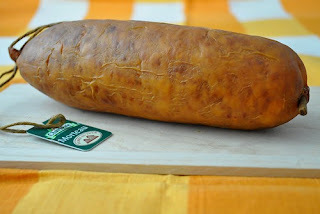 The Saucisse de Morteau IGP is a smoked pork, strongly flavored, salami-style sausage also called the Jésus de Morteau. The second name relates to the times when it was considered an essential part of local Christmas dinners. Whole Morteau sausages come in weights that vary between 400 grams (14 oz) and one kilo (2.2 lbs), They are produced with pork from the old region of the Franche-Comté where in this mountainous region the animals are still fattened traditionally. To be permitted to use the label "Saucisse de Morteau IGP," the sausages must have been smoked for at least 48 hours with sawdust from conifer and juniper tree within the tuyé chimney. The Saucisse de Morteau may be eaten without any additional cooking, but many local restaurants offer cooked dishes that include the sausage. 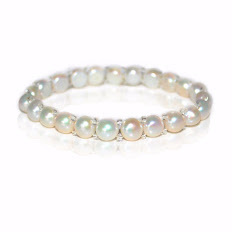 Production is limited to the plateau and mountains of the Jura and Doubs departments at an altitude higher than 600 m (2,000 ft) with the city of Morteau at the center of this artisanal industry. If you are traveling in the area you will see homes and farms with unique large chimneys called tuyés; these peculiar chimneys were, and some still are, used in the farm-produced version of this smoked sausage. These sausages are guaranteed by the IGP label, which denotes their quality, origin, and method of preparation as a regional French specialty. Authentic Morteau sausages have a metal tag as well as a small wooden stick wrapped around the end of the link. To celebrate their sausage’s gastronomic successes, there is an annual Fête de la Saucisse de Morteau, a sausage of Morteau Festival, every August. Morteau is a small town with some 7,000 residents, and apart from sausages it is also famous for its cheeses and historically for its clock making industry. Their watch and clock museum is an interesting part of the world’s watch and clock making history. 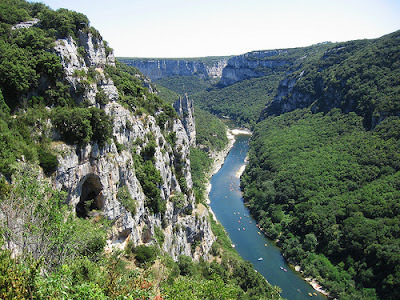 Morteau is in the department of Doubs that since 1-1-2016 is in the super region of Bourgogne-Franche-Comté, bordering Switzerland to the east. 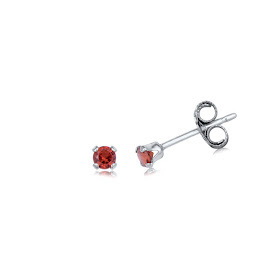 To enter the Tourist Information Office of Morteau’s English language website click here. Dos de Sandre en Écaille de Saucisse de Morteau, Carottes Colorées Glacées, Jus de Savagnin. A thick cut of pike-perch, or zander, the fish, covered with shavings of the Morteau sausage and served with glazed colored carrots and a sauce made from the Savagnin wine. This is a sweet wine and will be in restaurant kitchens all over France. The Savagnin wine comes from the Jura, a département in the région of Franche-Comté; part of the same région as the département of Doubs where the town of Morteau is situated. Saucisse de Montbéliard – This smoked pork sausage comes from the area around the city of Montbéliard in the département of Doubs in the Franche-Comté, the area is also home to the Saucisse de Morteau just 70 km (44 miles)away. Despite being close, these two sausages have different methods of production and very different tastes. The Saucisse de Montbéliard is spiced with caraway or cumin, nutmeg, garlic and white wine. Saucisse de Strasbourg – The Strasbourg sausage; a larger, and usually very much longer, version of the Frankfurter sausage. Strasbourg, the town, is the home of the European Parliament and the prefecture, the capital of the Alsace. The locals are as proud of their sausage as they are of their town's political importance so do not call this sausage a hot dog, even if it looks like one; the locals can get quite upset. The locals also claim that their sausages are much better than Frankfurters. 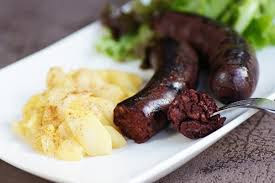 Locally, in the Alsace, the name for this sausage is knackis; use the local name carefully as is can also mean convicts.This sausage is part of the famed Alsace cuisine. Saucisse de Toulouse. – A beef, pork, and pork liver sausage, prepared with red wine, garlic, and other herbs. 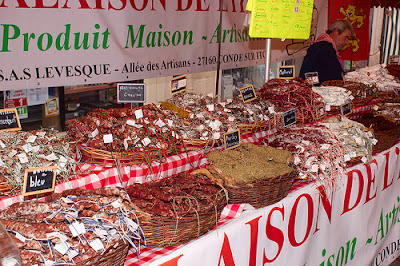 The Saucisse de Toulouse is considered an essential ingredient in many cassoulet recipes. Cassoulets are traditional, slowly cooked stews from the region of Languedoc-Roussillon. Sausages de Toulouse on the barbeque. Saucissons, are mostly smoked, cured and or air-dried large salami-type sausages, and they may be called a saucisson sec or sèche, a dry or dried sausage. As with all salami type sausage, there are tens, if not hundreds of recipes all of them cured or smoked in one of the traditional forms. Then, to confuse us, a butcher’s shop or supermarket may also have a saucissons frais on sale, a fresh saucisson, and that will indicate a large uncooked sausage. Smoked, cured or air-dried saucissons may be sliced and eaten cold. On restaurant menus, saucissons may be part of a plate or cold cuts and or served fried or grilled as part of another menu listing. Saucisson Chaud Sauce au Vin Rouge et Champignons - A cooked salami type sausage served with a red wine and a button mushroom sauce. Assiette de Saucisson, Jambon Cru et Pâté - A plate of cold cuts with slices of a salami type sausage, cured ham and pate. Saucisson Sec – Salami type sausages. with names, that do not include the words saucisse or saucisson. Andouilles; firm, spicy, fatty, cold-smoked sausage made mostly of pork tripe. Some North American visitors to France have told me that French Andouilles may be compared to American chitterlings, but with a lighter taste. On my own visits to the USA, I have never had the opportunity to taste chitterlings, and so I am just passing on the information; those who see chitterlings on the menu at home may check this out. Andouillettes; at their very early stages are similar to andouilles and made mostly with pork tripe; however there they begin to differ. Andouillets are probably France’s most beloved or hated sausage and very very strong tasting sausage. It is not always loved at first bite. Boudins Blanc and Boudins Noir. Boudins noir; the French version of the UK and Irish black puddings, a pig’s blood sausage. 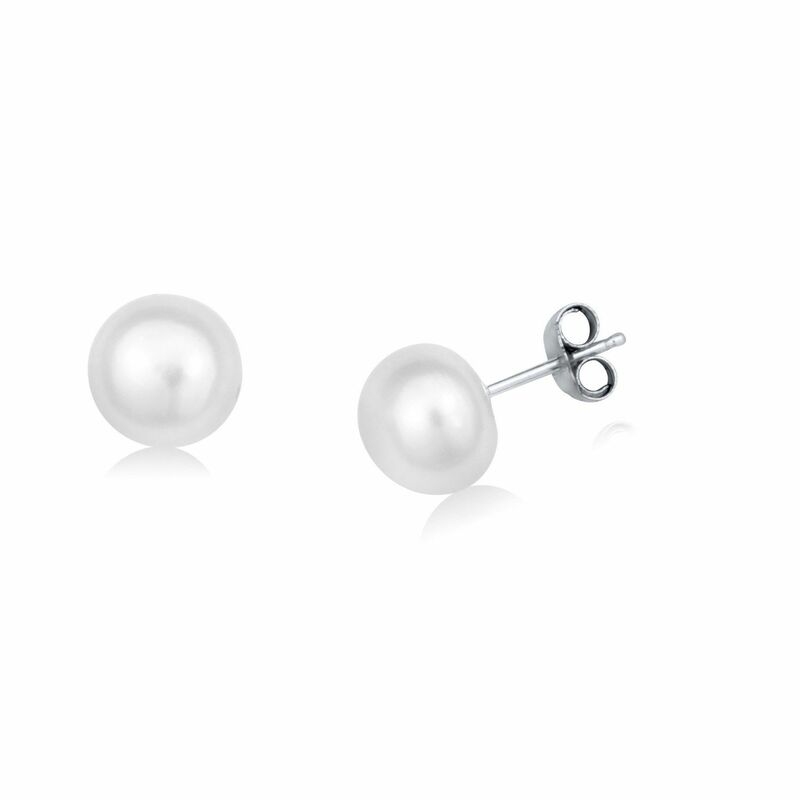 For more boudins blanc and boudins noir click here. Cervelas - A traditional sausage, originally made with a mixture of pork and pig’s brains. Cervelas sausage had and still has many traditional regional recipes. However, most cervelas sausages have seen a number of changes in the ingredients and most have removed the pig’s brains. 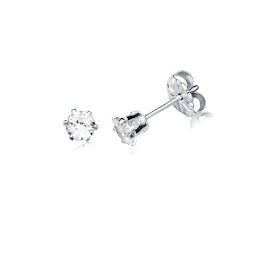 Not that there was anything wrong with them! Despite that, pig’s brains are no longer politically correct while veal and lamb’s brains are…go figure? Cervelas de Lyon – This Lyonnaise sausage is a variation of the traditional cervelas sausage though today it is pork meat only. This is a tasty, spicy and garlicky sausage. My informants have advised me that today the only brains used in manufacturing this sausage are in the marketing department at the factory. Chipolata or Chipolata - Thin, relatively small pork sausages. Chipolatas are made with smoked pork flavored with sage, thyme and sometimes basil or rosemary; fresh peppers or pepper are optional, every manufacturer has their own recipe. Crépinettes – A pork sausage wrapped in the crépine, the caul; the lacy see-through fatty membrane surrounding a pig’s stomach and intestines. The caul is used all over the world in traditional pork recipes including in North America. The caul is used for wrapping cooked meats; mostly sausages and other bits and pieces. Diots - Traditional sausages from the area of Savoie, Savoy, in the Rhône-Alpes. Some diots will be made with fresh pork and others with smoked pork and others with pork and cabbage. Nearly all will show their Italian connection by including maize flour, polenta, in their recipe. They will need their own post. Gayettes – Small, baked, pork liver and bacon sausages. 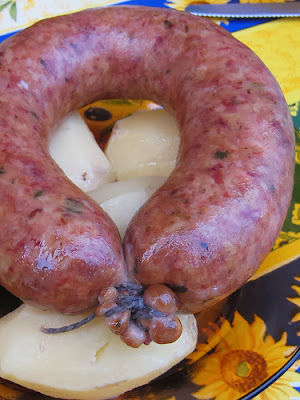 These sausages come in a variety of shapes and sizes usually flavored with nutmeg, garlic, and other herbs; these are traditional sausages and often made and wrapped in the crépine, the caul. Loukinkas - Small and very garlicky Basque Pork sausages. Melsat - A boiled pork, egg and bread sausage that may be aged for a few days and up to one month, from France's southwest. It may be served cold or cooked again. 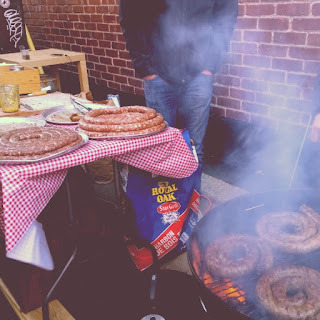 Merguez - A spicy mutton and or beef sausage that came to France from North Africa. This is a very popular sausage and for France a spicy one; it is flavored with cumin, coriander, garlic, and fennel seeds and spiced with harissa. (Harissa is made with chili peppers and other spices that give the sausage its bite and its trademark red color). Pormoniers or Pormonaise – A traditional pork and green vegetable sausage from the Savoie region and on many local menus. The ingredients may vary slightly but apart from the pork, usually includes cabbage, chard, leeks, and herbs. Saucissons d'Arles; a famous pork and donkey meat sausage from the town of Arles on the border of the Camargue. 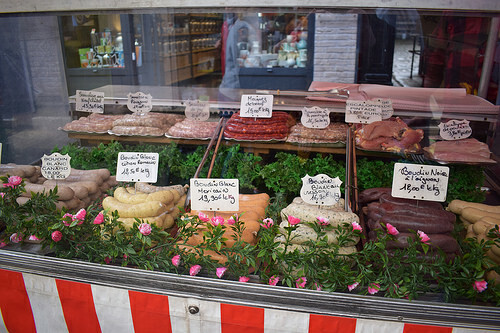 Sausages made with pork and donkey meat are traditional, and popular, in many parts of France. For a picnic in the country, you may have decided to buy a salami type sausage to accompany a bottle of cold white wine with a local cheese and a fresh baguette. 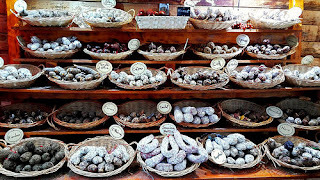 When stopping at the local supermarket or charcuterie do not be surprised to see a Saucissons d'Arles, with similar sausages called a saucissons d'âne, among the choices. France has far better and better-supervised animal husbandry laws that most Western countries. Donkeys raised on farms are grown for the meat industry and inspected and treated like any other farm animal. In Europe, donkey milk is also supplied to hospitals where children who cannot digest their mother’s milk or cow’s milk but can digest lactose, can accept this alternative. The city of Arles is also famous for its association with Van Gogh who painted there for a year, and also for the best preserved Roman amphitheater in Western Europe. Arles is on the edge of the Camargue in the département of Bouches-du-Rhône in the région of Provence-Alpes-Côte d'Azur. 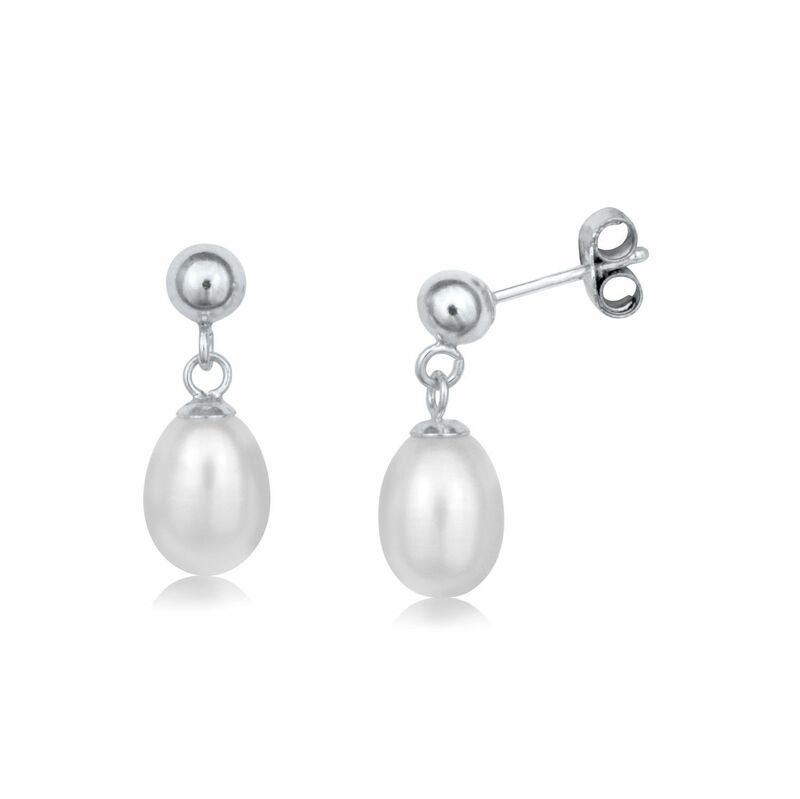 For more about the Camargue click here. Saucisson de Cheval – A horse-meat salami-style sausage. Horse-meat is still popular in France, as well as quite a number of other European countries. Horse meat is cheaper, leaner and sweeter than beef and has 50% fewer calories per 100 grams than beef as well as 30% fewer calories than chicken. Bistros and other restaurants may also have a horse-meat steak on the menu. In the USA horses are no longer raised for their meat; horses are raised for racing and other sports or as pets. During their short lives, the horses in the USA receive uncontrolled amounts of antibiotics, growth hormones, and other substances that can pass through the food chain to humans. To prevent these drugs from entering the food chain, the US closed all its horse abattoirs. Horses no longer suited for their original purpose are exported to abattoirs in Canada and Mexico. This has already severely affected the wild horses of the USA as the cost of keeping them free and controlled has no economic value. Commercially, French horsemeat is well controlled with every single horse identified. French horse farmers raise their horses for meat and are under government-controlled inspection. Therein lies the difference, French horses used for racing or for pets cannot enter the food chain along with farmed horses. 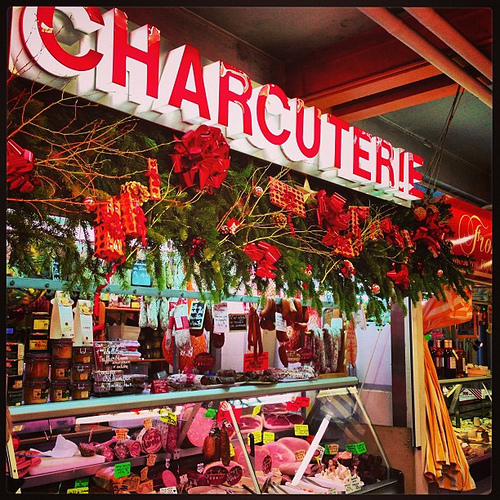 A good charcuterie will have at least one hundred different sausages on sale. Copyright 2010, 2014, 2016, 2010. Aligot on a French Menu; What’s That? Alsacienne (à l’) - Cuisine à l'Alsacienne - Dining in the manner of the Alsace. Bistros - French Bistro Menus. The History of the French Bistro. Boudins Blanc and Black Puddings on French Menus. Charcuterie-Traiteurs in France. The Ultimate Full Service Delicatessen? Chou - Cabbage. Cabbage in a French restaurant? Of Course, Cabbage is very important in French Cuisine. Lentilles – Lentils. 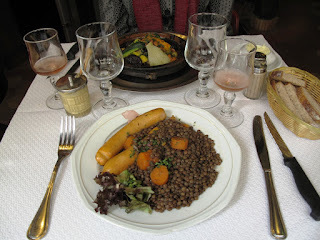 Lentils are all over French Menus. The Lentil in French Cuisine. Sandre - Zander in the USA and Pike Perch in the UK. Sandre in French Cuisine. The Vins de Jura - The Wines of the French Jura. Jura Wines on French Menus.